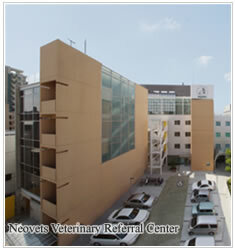 Neovets Veterinary Referral Center - For you and beloved animals. Since 2005, Neovets Veterinary Referral Center(also known as Neovets VR Center)has been providing veterinary healthcare services in Osaka, Japan. As a referralcenter, our mission is to meet the medical needs of the patients, clients and theirprimary physicians in our community by rendering evidence-based and bond-centered medicine with the goal of enhancing the lives of both people and animals. Our veterinarians are specialized in but not limited to orthopedics, ophthalmology,neurology, and soft tissue surgeries. The center is fully equipped with the latest facilities which include 320 Area Detector CT scanner and 1.5T MRI system. Copyrights © 2008 Neovets Inc. all rights reserved.